Location: Balneohotel Pomorie is situated between the coasts of the Salt-water lake and Black sea. The hotel is designed to give an opportunity to the guests to take full advantage using the two swimming pools. The medicinal-rehabilitate complex is situated on 2500 sq. m. and it is equipped with the latest achievements in the medical machinery. You can find combination of medicinal, rehabilitating and relaxing procedures in cozy atmosphere which transmits you to natural and healthy way of life. The facilities in the complex use in maximum the unique for whole Europe medicinal quality of the Pomoriiskata mud and lye. Accommodation: The hotel disposes with 150 rooms, 19 apartments, 2 VIP apartments and 4 rooms for disabled people. Food: 3 restaurants – main, restaurant for healthy food, barbecue, 7 bars, library, mini golf, billiard and private beach. Balneohotel Pomorie is a perfect place for training of professional sportsmen and teams, proposing excellent conditions for training sessions, recreation and holiday. • Тhe football stadium with 2500 covered seats and electric lighting. • Two fitness centers - the one for heavy professional loading, the other for good physical shape. 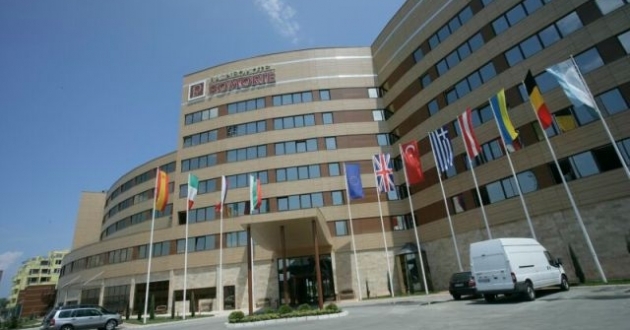 In 2009 Grand Hotel Pomorie has been awarded with “The Best Hotel on the Balkan Peninsula” prize. The hotel received the prestigious award “Diamond Globe” from the International Hotel and Restaurant association (IH&RA). 200 hotels and 6 million restaurants from all over the world are members of this association.